Complete the Free Application for Federal Student Aid (FAFSA) early each year. 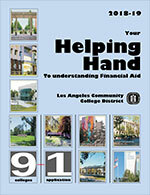 Los Angeles Valley College's Federal School Code is 001228. After you submit your FAFSA, online or by mail, you will receive a Student Aid Report (SAR) and the college will receive your record electronically if you listed the college's federal school code on your FAFSA. Review the SAR to make sure it is accurate. If any information is wrong, contact the financial aid office to find out how to make corrections. By completing the FAFSA, you will also automatically be considered for the Board of Governors Fee Waiver (BOGFW); a separate BOGFW application is not needed. Upon the college's receipt of your FAFSA information, you may check the Student Information System to see if you need to take additional steps to complete your financial aid file. If you are required to submit additional documents after you have completed the online process, you must submit these in person to the Financial Aid Office. Incomplete documents will not be accepted and will be returned to you with further instructions. If there is a discrepancy on any one of the above items, you will be requested to resolve the discrepancy, which could delay the review of your financial aid file. Most financial aid programs use three components to calculate eligibility: Cost of Attendance (COA), Expected Family Contribution (EFC), and Financial Need. COA includes college fees, books and supplies, room and board, transportation and personal/miscellaneous expenses. The EFC is the amount you (and if applicable your family) can contribute toward the cost of attendance. The federal processor calculates the EFC using the information you reported on your FAFSA. Sometimes corrections are required and may result in a change of the EFC. Financial need is determined by subtracting the expected family contribution from the cost of attendance. Need is the maximum amount of need-based aid you can receive in a given academic year. 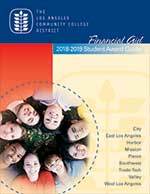 You may view your award status and disbursement schedule on the Los Angeles Community College District Student Information System (SIS). Financial Aid awards listed on your Award Notification Letter are based on the assumption that students will enroll full-time. Students do not have to enroll full-time to receive financial aid. The disbursement amount will reflect your approved active units at the time of disbursement.